Based on the supernatural horror film of the same name, iSoftBet’s Paranormal Activity online and mobile slot game recaptures the chilling visuals and audio from the 2007 independent hit while boasting a host of thrilling bonuses and free spin features. Pending the success of this first licensed slot release (which is already a hit), we may be in for some Paranormal Activity slot sequels in the not too distant future. Paranormal Activity is a 243 ways interactive slot game, which means there are a total of 243 fixed winning combinations that run from the left to the right of the display (symbols must be adjacent to each other). The number of ways to win is calculated by multiplying together the three positions on each reel by the total number of reels, like so: 3 x 3 x 3 x 3 x 3 = 243. Winning combinations cause the symbols to showcase spooky animated visuals, some lifted directly from the film itself. The visuals can also be viewed by tapping on each icon individually. 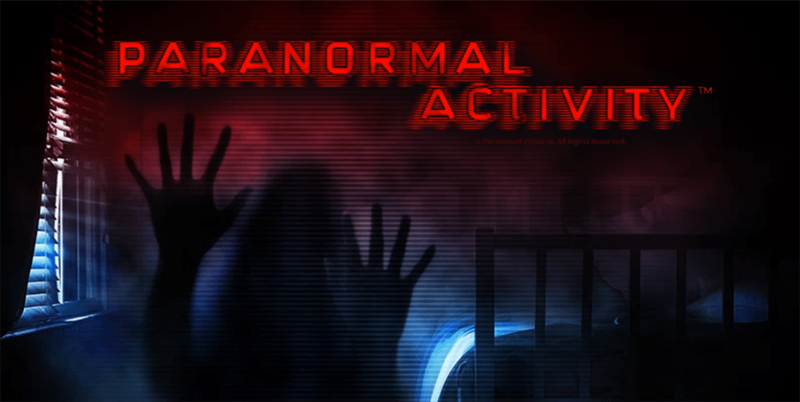 The Paranormal Activity slot game also has an auto-play feature that allows players to set up to a total of 1,000 automated spins at any chosen coin bet value. 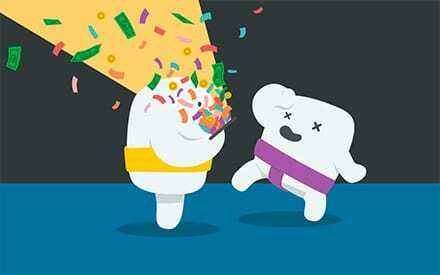 Players can also set a loss limit or win limit that, when reached, shuts off the auto-spin feature. Payouts are multiplied by selected coin value. Check out the pay table (the i button below the reels) for a complete run down of symbol pay outs and game rules. 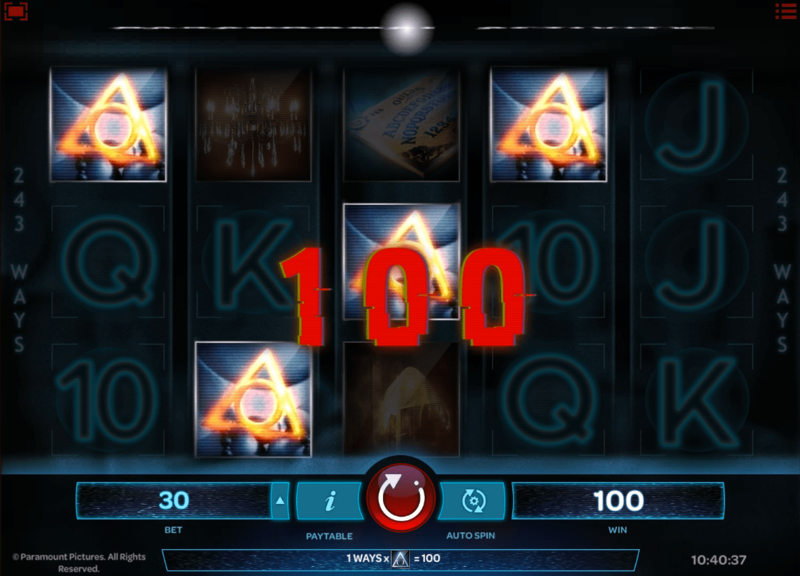 The Paranormal Activity online slot game boasts multiple unique and high-paying bonus features, all of which are paired with well crafted and frightening animations and sounds. Wild symbol: This icon will replace all other symbols (except the scatter symbol) in order to form or extend a winning combination. Scatter symbol: Scatter symbols pay out in any position on the reels. Paranormal free spins: Unlimited free spins until you’ve registered five wins. Each of the five wins is greeted with an increasing multiplier (x1, x2, x3, x4, x5). 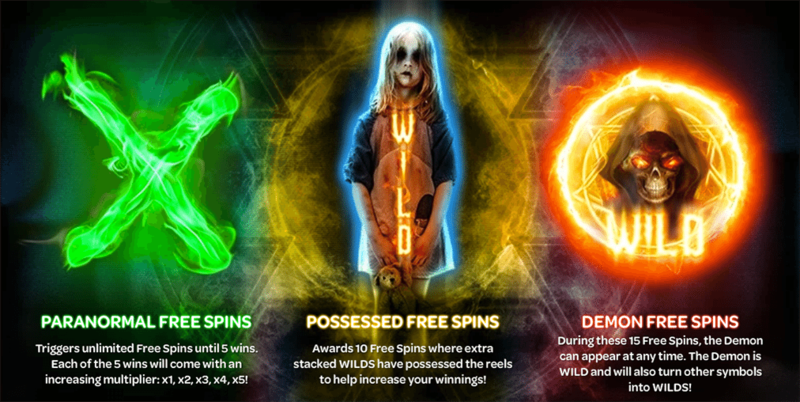 Possessed free spins: Win 10 free spins where wilds become possessed and stacked to fill the entire reel, thus creating huge winning opportunities. Demon free spins: Score 15 free spins where a demon figure can appear on the reels at any time, acting as another wild and replacing all symbols (except the scatter) to form winning combos. Instant wins: Multiplied by the coin value staked on the spin that triggered the bonus wheel round. Paranormal Event: Randomly, at the start of any spin, you may experience some paranormal activity. The screen will turn static, and up to five wild symbols will appear and freeze in place on the reels for that spin. iSoftBet’s Paranormal Activity pokie game can be enjoyed for both real money and with practice cash at top rated casino sites like Slots Million and Mucho Vegas – you can use our table above to read detailed reviews of each casino or sign up to claim your new player welcome bonus. We only recommend safe casino websites that have earned approval from independent test and player protection agencies such as eCOGRA, and which are licensed and registered by gaming governing bodies like the U.K. Gambling Commission, the Malta Gaming Authority and Curaçao eGaming. 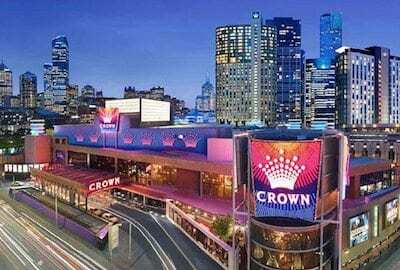 All online slots and other casino games offered by our top-ranked gambling sites in the table at the top of this page can be played directly via Web browsers with no installations required. Players can enjoy hundreds upon hundreds of real cash slots that are fully optimised not only for desktop and laptop, but also for mobile and tablet play on Android, iOS, BlackBerry and Windows Phone. Our rating: iSoftBet has designed a compelling, unsettling and thrilling virtual slot game here, paying great tribute to a horror flick that quickly became a cult classic. With creepy visuals and animations, an eerie soundtrack, and some unique and immersive bonus features, this game keeps you on edge with great suspense and the potential for big wins. We rate it 4.5/5.